Bachmann Trains have unveiled new merchandise for 2013 including more from the Thomas & Friends line. 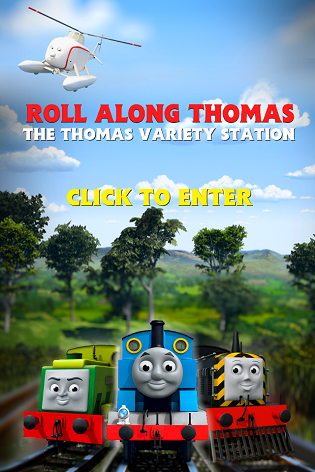 Their latest yearly catalogue released today features fellow Thomas rivals Chuggington as cover stars. Thomas' Christmas Express starts off the HO Scale range which decorates Thomas with his snowplough and a Santa hat. A Christmas tree on a truck, a crate load and a Merry Christmas van complete the set. In a move by Bachmann, Thomas is also the first character to be able to talk while running on rails with the brand new Speed-Activated Sound. Now you can hear Thomas’ steam sounds! With an analog sound system including steam chuffs, periodic whistle and steam blow-down upon stopping, this sound-equipped Thomas brings to life the sights and sounds of Sodor. With Duck setting pre-orders alight, Arry and Bert are confirmed to be the next engines to join the line after the likes of fellow duos Bill and Ben and Donald and Douglas. More so for rolling stock is a fourth Troublesome Truck and a third vehicle member in the form of Jeremy the Jet Plane. Lastly and excitingly for Large Scale, Toby the Tram Engine will become the fifth engine to join the bigger scale series. A Blue Open Wagon and a Raspberry Syrup Tanker will also follow. The new Thomas & Friends products from Bachmann hit US model and hobby stores this year. Thanks to Bass Tbone for the alert. Honestly, i agree with you Chris. Everyone wanted to see Trevor as well. A full year later, we STILL have no idea what Troublesome Truck #4 looks like.